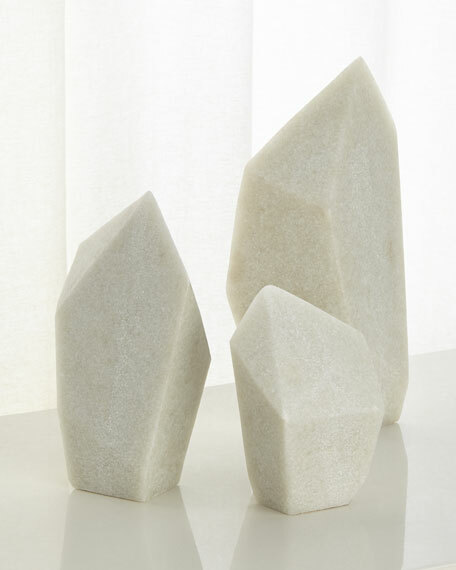 Like geometric pillars, sculptures add a bit of modern sophistication to a table, desk or shelf. Ivory finish makes them almost identical to marble, with even, prism surfaces and clean lines with modern class. Whether as bookends and paperweights or simply as decorative accents to elevate a look. Set of three assorted faux-marble (resin) sculptures. Small, 5"W x 3.5"D x 8"T.
Medium, 6.5"W x 4.5"D x 11.5"T.
Large, 7.5"W x 5"D x 14"T.